Bridges endure a LOT of stress on a daily basis. Have you ever wondered how bridges accommodate the stresses we apply to them? Why does the constant vibration of Los Angeles traffic not crack foundations, why does the sudden breaking of a speeding freight train not separate steel from its anchors? When travelling the world; to and from work, to the mall, or to the side of the road to ponder the world’s largest ball made from rubber bands – people cross bridges. The big ones impress, the smaller spans are hardly noticed. Most people never wonder how these structures accommodate the stresses applied to them. Why does the constant vibration of Los Angeles traffic not crack foundations, why does the sudden breaking of a speeding freight train not separate steel from its anchors? Man-made stresses are no match for Mother Nature. Outdoor structures of every kind either concede to her superior strength, conform to her movements, or they fail. How then, can bridges and dams stand up to Chicago’s cold, to Arizona’s heat, and to California’s rumbling earthquakes? This recently released education aid describes the unique ability of polymers to stretch and recover in the context of how they help keep bridges safely suspended. More specifically, it covers the eight characteristics of properly compounded rubber that allow man-made structures, like bridges, to recover from such a wide variety of stresses over time. The parts that prevent bridge components from failing under stress are called bearing pads. They are mostly made out of Neoprene rubber and they sit between the concrete pilings and bridge surfaces – allowing the bridge surface to vibrate and to expand and contract without grinding against the concrete that holds them up keeping it all in the air. Hardness – Hardness keeps a material from squeezing down into a pancake, and the amount of acceptable “squeeze” has been designed into every bridge you cross. 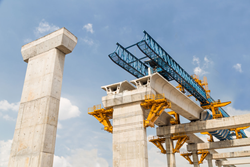 Tensile properties – A bridge bearing pad, in order to protect the concrete piling and bridge surface, has to move in place of the piling underneath it. As the bridge moves laterally the rubber naturally distorts forward and backward. Compression – Compression is a measure of a material’s ability to squeeze down yet return to its original thickness. Density – Density is a frequently misused term. People often say that they want a firm density or a soft density when density is actually an expression of a substance’s weight in pounds per cubic foot. Density is more a measure of the content quality of rubber than a description of its physical characteristics. Oxygen Resistance – A rubber article that has been degraded by either oxygen or ozone looks like there is a silver-gray film and/or has cracks on its surface. Compounders needs to put antioxidants into the rubber to slow down the oxidation of the polymers over time and extend the life of the bearing pad. Temperature – Temperature influences the properties of polymers much more than with many other construction materials. This is not just seen as variations in the actual properties when the temperature changes but also in that critical temperatures are reached relatively early. Resilience – Resilience is actually a measure of the ability of a rubber compound to recover to the specified thickness under pressure and deformation, how elastic it is when exposed to various stresses. From earthquakes and hurricanes, to freight trains and LA traffic, neoprene rubber components need to function as designed decade after decade. The effects of sunlight, ozone, heat, and cold need to be address as well in the formulation so that the bearing stretch and recover and protect bridges and other critical infrastructure. The full article provides a more in-depth exploration of each of the characteristics, and offers insights into the corresponding measurements, and how to interpret them. The full article “Invisible Infrastructure – building bridges on the properties of neoprene rubber” and images can be viewed and/or downloaded on the website –Read full article, click here.